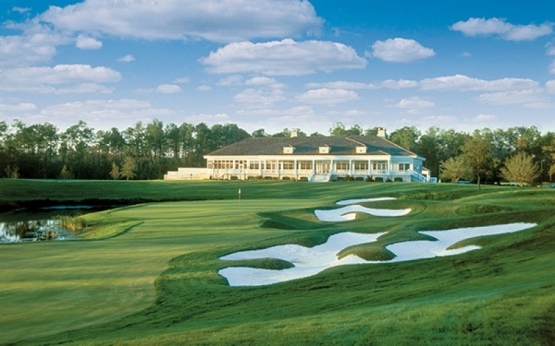 Famed golf course architect, Tom Fazio, certainly lived up to his reputation when he designed TPC Myrtle Beach. Over the past four decades, Fazio has designed over 120 world class golf courses and has more courses ranking in the top 100 in the United States than anyone else. This includes TPC Myrtle Beach. TPC Myrtle Beach once played host to the Senior PGA Tour Championship and was proud to award the championship to World Golf Hall of Famer, Tom Watson. It remains today as the only Myrtle Beach golf course to earn 5-Stars from Golf Digest Magazine. The course itself winds its way through towering pines, water hazards and strategic bunkering. The always beautifully maintained fairways and greens provide an outstanding golf experience for those who want to experience what it feels like to play a “Tour quality” golf course. While the course can be very challenging, it offers several sets of tees to ensure that it is playable for everyone. The course measures 6,950 form the black tees, 6,600 from the blues, 6,193 from the whites, 5,783 from the golds and 5,118 from the reds. If it is a Myrtle Beach golf lesson you are looking for be sure to check out the Dustin Johnson Golf School. Allen Terrell who coached Johnson while he played for Coastal Carolina University in the early 2000’s is the head of instruction. Myrtle Beach Golf Authority has the ideal Myrtle Beach golf package for everyone. Their outstanding Myrtle Beach and North Myrtle Beach accommodations are second to none. Myrtle Beach Golf Authority Golf Director, Cathy Ziegler and her assistant, Karen Gilmond have years of experience and knowledge that can only be attained by being golfers themselves. If you are looking for some fantastic Myrtle Beach entertainment or suggestions on Myrtle Beach restaurants they will be happy to help. It is time to plan your Myrtle Beach golf package today! First played the TPC in 2012 and was a bit wary of returning as some of the reviews that I had come across seemed to indicate that the condition and upkeep had slipped a bit - well to me it was better than ever !! This was a great experience for our 4 ball from the well stocked pro shop to the driving range and to the starter, Richard, who was a real gent and kept us amused with his many Irish jokes !! The course was in supreme condition with only the 18th being non-cart (amazing for the recent rain fall). We had a great day and took advantage of the Taylormade demo day on the range. Again this is a course that we will return to play again as there isn't a weak hole to be found. The greens were the fastest that we played on all week and good shots were rewarded. Really disappointed in this experience. Don't get me wrong, this is a great track. My group played it twice a few years ago and loved it. After this round, the consensus is that the course it has "slipped" and is resting on its laurels. When we pulled up, we had to unload our own clubs. The fairways were not up to a TPC standard. There are virtually no markers for distance. No one told us that bird houses marked the 150 - we figured that out after 7 holes. Again, these are all "minor and ancillary" issues - but if you want to claim you are a five star course, you need to treat the patron you are charging $175+ like a wanted guest. Bottom line is that I felt like the course was cutting corners on service and maintenance that you would not expect at a TPC facility. Slowest round of golf I ever played. Ranger had no control. 6 hours for 17 holes. Had to stop due do darkness and 3 groups on 18 (tee, fairway and green).